Add different users to your team and control different access levels to your organization’s collateral. On the Business plan, there are 5 different user roles. Owner – This is the user that creates the team account. They have access to all features and unlimited folios, including managing the style guide, and are able to manage team members and billing. Admins – Admins have access to all features and unlimited folios, including managing the style guide. Admins are also able to manage team members, but will not have access to billing. 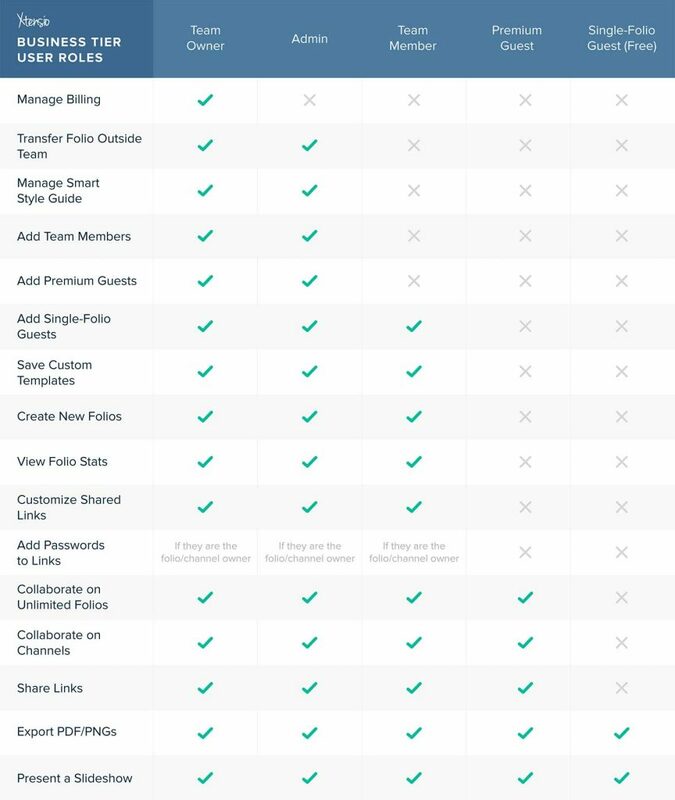 Team Members – Team members have access to all premium features and can create an unlimited number of folios. They will not be able to manage the style guide nor add team members or premium guests. They can, however, add free guests as a collaborator on one team folio. Team members can also customize individual folio and template links. Premium Guests – These guests can edit as many folios as you need them to, but they will not be able to create new folios. This gives you more control of your organization’s collateral and is a good option for adding clients to work with your team on folios created for their projects. Premium guests will not have access to all team features. Single-folio Guests – These are free guests that can be added as a collaborator to one of your team’s folios (essentially the Free personal plan). Your team will have 5 single-folio guests for each team member. Learn more about the Business plan.